Create ten awesome makes from egg cartons and some simple craft essentials. Follow step-by-step guides and handy cutouts to make a penguin, an owl, a fire engine, a hen, a crab, a pirate ship, a dragon, a whale, shakers and a car. 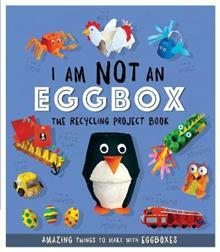 For boys and girls alike, this crafty book will m... read full description below. Create ten awesome makes from egg cartons and some simple craft essentials. Follow step-by-step guides and handy cutouts to make a penguin, an owl, a fire engine, a hen, a crab, a pirate ship, a dragon, a whale, shakers and a car. For boys and girls alike, this crafty book will make you think twice about the humble egg carton! Sara Stanford is a freelance writer and editor with a passion for arts and crafts. She has worked on licensed and own-brand books, magazines and partworks.